Indeed, history suggests that many investors cling to hope all the way down. As this chart of the average holding period for a NYSE stock illustrates, investors actually turn up the hope and cling most tenaciously to their shares in bear markets. In bull markets they may espouse the buy and hold approach, but the chart shows that they don't actually practice what they preach. The average holding period plunged through the last 60+ years of advancing stock prices and fell to a low of just 9 months in 2007. The decline brought the average below the previous record lows of just under one year in 1929 ... . Upward spikes on the chart end near bear markets in the early 1940s, 1974 and 1990. 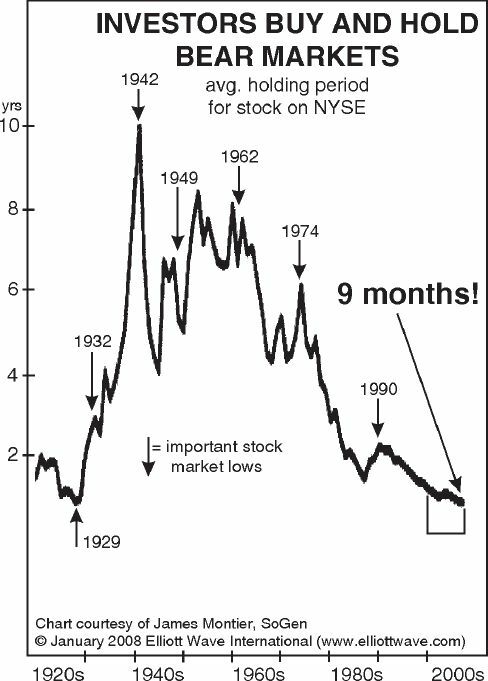 Also notice that the most bruising period for stocks, the 13 years that followed the 1929 peak, produced the longest holding periods. So, the harder stocks fall, the tighter the grip of investors gets. The Dow Industrials closed at 12,582 on February 28 (the date that the March 2008 Financial Forecast published). By May 2, an upward correction had taken the Dow to a close of 13,058. Investors who had stayed in the market during the initial leg down believed they saw light at the end of the tunnel. But, the worst of the decline was yet to come. The Dow closed at 6,547 on March 9, 2009. Our analysis indicates that the next bear market could be far more severe. This article was syndicated by Elliott Wave International and was originally published under the headline Amid Stock Market Turmoil, Investors Cling to Hope. Why?. EWI is the world's largest market forecasting firm. Its staff of full-time analysts led by Chartered Market Technician Robert Prechter provides 24-hour-a-day market analysis to institutional and private investors around the world.